It’s been a relatively warm fall so far — the third warmest on record — but don’t take a kinder, gentler autumn for granted. Instead, use the time wisely and ensure your house’s plumbing is ready for winter. Before the big chill hits, check your house to make sure your water meter and any water lines that are in unheated or exp osed areas, such as a basement or crawl space, are either insulated or wrapped in heat tape. If you’re unsure how to do this, contact a licensed plumber. Turn off any water to an outside source (such as a garden-hose hookup). There’s usually a shutoff valve inside the house somewhere. Then drain that outside faucet, leaving it open a bit to ensure that if any water is still trapped inside, it will expand out the opening when it freezes, not expand and crack the pipe. It’s also a good time to button up your house. Expanding, spray-foam insulation is a fairly inexpensive way to do this, and can be used to seal up areas where wires or pipes enter the house through a wall or foundation, or even seal up larger gaps around windows and door trim. Check the caulking around windows and doors, too: if it’s peeling or cracked, remove the old caulk carefully and replace it with a newer, silicone-based formula that will last for years to come. If you have storm windows, now is the time to remove the summer screens and install them. Gaps under doors often leave the uninvited cold air in, so install a door sweep — there are a number of types that have an adhesive backing, so no drilling is required. Finally, if your pipes do freeze when the cold weather hits, do NOT use a torch to thaw them. Instead, use a hair dryer to thaw them slowly. Torches are the most common cause of house fires when they’re used to thaw pipes. 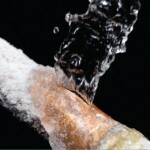 If a pipe ruptures during a freeze, find the shut-off valve and turn off the water. This is often located on the main service line. You may also have separate shut-off valves for outside pipes or other areas in the house.